Here are the summaries of stars researched and analyzed in the MISAO Project, stars you reported us the information on which, and stars whose interesting features were discovered in the MISAO Project. EK And Red variable with 185 day period, but not a variable in fact. FN And Outburst was detected of an UG-type cataclysmic variable. FS And Outburst was detected of an UG-type cataclysmic variable. V725 Aql Outburst was detected of an UG-type cataclysmic variable. V1047 Aql Outburst was detected of an UG-type cataclysmic variable. HV Aur Outburst was detected of an UG-type cataclysmic variable. V496 Aur Outburst was detected of an UG-type cataclysmic variable. TT Boo Outburst, and rapid fading, was detected of an UG-type cataclysmic variable. OV Boo Masaru Mukai discovered the outburst of an UG-type cataclysmic variable. AF Cam Outburst was detected of an UG-type cataclysmic variable. DK Cas Outburst was detected of an UG-type cataclysmic variable. V723 Cas Small brightening was detected about 6 years after discovery. SV CMi Outburst was detected of an UG-type cataclysmic variable. GZ Cnc Rebrightening of an UG-type cataclysmic variable was detected within only 1 week. V542 Cyg Outburst was detected of an UG-type cataclysmic variable. V767 Cyg Outburst was detected of an UG-type cataclysmic variable. V792 Cyg Several outbursts were detected of an UG-type cataclysmic variable. V868 Cyg Outburst was detected of an UG-type cataclysmic variable. V1006 Cyg Outburst was detected of an UG-type cataclysmic variable. V1113 Cyg Outburst was detected of an UG-type cataclysmic variable. V1504 Cyg Outburst was detected of an UG-type cataclysmic variable. V2289 Cyg Outburst was detected of an UG-type cataclysmic variable. V1008 Her Outburst was detected of an UG-type cataclysmic variable. AW Gem Pre-discovery image of an UG-type outburst was found. KT Gem Outburst was detected of an UG-type cataclysmic variable. PS Lac Outburst was detected of an UG-type cataclysmic variable. V584 Lyr Outburst was detected of an UG-type cataclysmic variable. V426 Oph Small outburst of the nova-like star was detected. NS Per Outburst was detected of an UG-type cataclysmic variable. RY Ser Outburst was detected of an UG-type cataclysmic variable. V386 Ser Masaru Mukai discovered the outburst of an UG-type cataclysmic variable. V735 Sgr Mistake in past paper was revealed, and position was corrected. V5558 Sgr Measured from SOHO/LASCO images during the gap of observations. V354 Vul Mis-identification in IBVS 4450. V405 Vul Revealed to brighten in outburst frequently with an interval of about 2 months. GCN2056 var New eclipsing variable near by GRB 030329. GSC 3646-01698 Discovery of fast moving star, missed by the past surveys. NSV 02026 Outburst was detected of a possible cataclysmic variable. NSV 24062 = V4683 Sgr Recovery of Yukio Sakurai's symbiotic star. OT J063213.1+253623 Dwarf nova discovered at Ka-Dar Observatory, also in our survey images on the same day. OT J094854.0+014911 New cataclysmic variable of Catalina Sky Survey was already bright 4 days before discovery. OT J170609.7+143452 Outburst was detected of an UG-type cataclysmic variable. SDSS J032015.296+441059.3 Outburst was detected of an UG-type cataclysmic variable. TmzV868 Not red, but magnitude differs between the reflector and camera lens. MisV0001 = V4652 Sgr First new variable caused by Sakurai's object. MisV0002 = V523 Aur First new eclipsing variable caused by Comet 52P/Harrington-Abell. 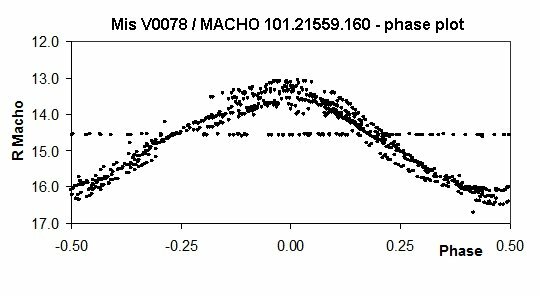 MisV0005 = V2586 Oph V854 Oph is suspected not to be an emission-line star, but denied. MisV0015 Suspected as GCAS type, but due to mis-identification. MisV0047 = V4690 Sgr Suspected as X-ray source, but a Mira type. MisV0055 = V5534 Sgr Suspected as recovery of a missing CD star, but denied. MisV0106 = V2249 Cyg Mistake of chart in the NSV 25425's discovery paper is discovered. MisV0134 Recovery of a lost star NSV 11661. MisV0187 Suspected as recovery of a star captured by chance in 1920, but denied. MisV0297 = V364 Ser Suspected as recovery of a nova in 1960, but denied. MisV0372 = V5382 Sgr Suspected as X-ray source, but a Mira type. MisV0380 Suspected as a cataclysmic variable, but denied in the MSDG-MISAO Campaign. MisV0508 = V949 Sgr Nova in 1914 is actually not a nova. MisV0525 = V1694 Aql Suspected as X-ray source, but a Mira type. MisV0562 Suspected as recovery of a RCB type V915 Sgr, but denied. MisV0645 Suspected as recovery of a nova in 1926, but denied. MisV0701 = V1511 Aql Studies of the nearby planetary nebula PK 32-3.1 have been strongly influenced by this star. MisV0814 Peculiar variable. Usually constant, but rarely shows minute-scale rapid variations. MisV0898 Not found in any catalogs despite the brightness, but denied. MisV0909, MisV0910 A pair of double variable stars. MisV0968 = V423 Vul One of the binary Pourteau 3835 is variable. MisV1024 Red variable, but 2MASS color is not so reddish. MisV1051 Suspected as X-ray source, but denied. 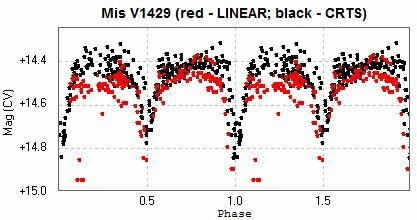 MisV1096 = V441 And W UMa-type eclipsing variable with same brightness at primary and secondary minima. MisV1097 = V444 And Blue W UMa-type eclipsing variable. MisV1140 = V450 Lac Eclipsing variable in a dark cloud. Not GH Lac. MisV1147 = V730 Cep Young stellar object with queer variation. MisV1181 = V709 Cep Nova missed in 2001 was discovered in 2002. MisV1202 = V728 Cep Overlapping on an emission nebula. MisV1222 = V1001 Cas Beta Lyr-type eclipsing variable. Or maybe rare EA/RS type? MisV1223 = MN Cam Bump Cepheid variable. Light curves in multi colors are obtained. MisV1224 = MQ Cam Cepheid variable with light curves in multi colors. MisV1237 = V522 And Our second eccentric binary. MisV1262 Suspected as a strange Mira variable also bright in V-band, but denied. MisV1267 Carbon star with H-alpha emission. MisV1269 Possible variability found in the public data was confirmed by the MISAO images. MisV1286 One of the three candidates of NSV 11227. MisV1306 = V754 Per Unusual eccentric binary. MisV1325 Identified with IPHAS emission-line star, and revealed to be a Herbig Ae/Be type star. MisV1333 Once identified with DV Oph, but it was a mis-identification. MisV1336 Irregular variations both in long term and in several hours. MisV1339 SR variable with a short term oscillation. MisV1340 Adjoining to a Mira variable, another new Mira variable was discovered. MisV1351 The eclipse is very rare. Maybe EA/GS type with a long period. MisV1372 Non-red variable with a slow variation of about 20-30 day period. MisV1396 Suspected as a remarkably blue star, but denied. MisV1427 Chromospheric activity may be detected. MisV1429 Eclipsing variable with chromospheric activity and variation caused by a spot cycle. MisV1436 = QSO B0133+47 Optically violently variable quasar. MisV1439 = OT 081 Another optically violently variable quasar, but this is well known. MisV1441 Young stellar object with an H-alpha emission in a star forming region. 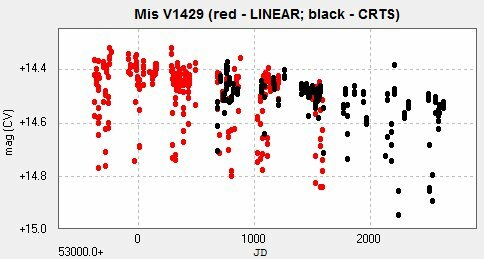 MisV1442 New eclipsing variable in the LONEOS Photometry File. MisV1443 Bright dwarf nova, 12.8 mag at brightest. MisV1445 Possible real-time flare detection of a new flare star. MisV1446 = 1RXS J074112.2-094529 Outburst of an X-ray source. MisV1448 Bright dwarf nova, 12 mag at brightest. MisV1449 Possible new cataclysmic variable at 15 mag. It is a red variable with a range of 1.1 mag and period of 185 days, however it was not variable in fact (IBVS 5396). Outburst of a dwarf nova FN And was detected on Dec. 9, 2011, in the course of Oku Survey by Youichirou Nakashima on the first survey images of a new 300-mm camera lens. It was fainter than 16.7 mag on Nov. 16, fainter than 15.8 mag on Nov. 26, but detected at 14.1 mag on Dec. 9 [vsnet-alert 13946]. Then it was revealed that FN And was already bright as 13.5 mag on our test images on Dec. 5 through thin clouds [vsnet-alert 13948]. This outburst was only observed by Gary Poyner on Dec. 9 at 13.8 mag, except for the observations by the MISAO Project. It was bright at around 15.5 mag on Oct. 23, 2012, from Youichirou Nakashima's survey images. It tends to be in outburst frequently. The AAVSO database shows it brightened up to 15 mag in September. But nobody reported the outburst in October [vsnet-alert 15230]. Outburst of a dwarf nova V725 Aql was detected from survey images by Youichirou Nakashima, at around 14.0 mag on 2012 Apr. 16.73 (UT). It was not visible in the past images on 2012 Mar. 27.82 (UT) (Image) [vsnet-alert 14450]. The last outburst was recorded in 2011 May by the VSNET and AAVSO database. Taichi Kato reported that the present outburst is superoutburst because 0.2-mag superhumps were observed by Astrokolkhoz team (J. Hambsch and T. Krajci) [vsnet-alert 14460]. Dwarf nova V1047 Aql was detected at around 15.5 mag on May 12.68, 2012 (UT) from survey images by Youichirou Nakashima [vsnet-alert 14579]. Rod Stubbings and Taichi Kato commented that V1047 Aql was revealed to be a SU UMa-type dwarf nova based on the observation by Greg Bolt during 2005 August outburst [vsnet-alert 14584]. We detected that a dwarf nova HV Aur in outburst at 16.3 mag on Sept. 25.69, 2012 (UT) from Youichirou Nakashima's survey images. Note that the brightness range of HV Aur is 14.7-<19 mag in the GCVS [vsnet-alert 14956]. It was bright at 16.2 mag on Oct. 18, 2012, from Youichirou Nakashima's survey images [vsnet-alert 15230]. Outburst of this UG-type cataclysmic variable was detected, and its rapid fading was recorded, by chance in the survey in 2007 April by Nobuo Ohkura and Youichirou Nakashima. It kept bright as 14 mag from Apr. 9 to 12, then became slightly faint as 14.6 mag on Apr. 14. Then it faded rapidly down to 16.6 mag on Apr. 19. It became invisible, fainter than 17.5 mag, on Apr. 23. (Image, Light Curve). The AAVSO database revealed that it was fainter than 16.5 mag until Mar. 31, but it brightened up to 13 mag on Apr. 1. It kept brighter than 14 mag until Apr. 17, then it faded rapidly as 16 mag on Apr. 19 and 17.5 mag on Apr. 20. Masaru Mukai discovered it brightened up to 11.4 mag on Mar. 14, 2017 [vsnet-alert 20778]. Keisuke Isogai suggests this outburst is very likely to be a WZ Sge-like superoutburst [vsnet-alert 20779]. Hidehiko Akazawa operated time series photometry and detected its peculiar superhump (Summary), (Mar. 14), (Mar. 15), (Mar. 17), (Mar. 18). Outburst of this UG-type cataclysmic variable up to 13.7 mag was detected by chance in the survey on 2007 Feb. 12 by Nobuo Ohkura and Youichirou Nakashima. It had never been brighter than 16.5 mag in the MISAO Project images between 1999 and 2002. Yutaka Maeda reported it as "not seen", fainter than 14.1 mag, just on the same day, Feb. 12, in the VSOLJ database. Taichi Kato commented that Gary Poyner detected it as 13.4 mag on Feb. 6 and we observed during its fading phase. It was bright at 15.3 mag on Oct. 20, 2012, from Youichirou Nakashima's survey images. The AAVSO database contains only faint observations around 18 mag in 2012 autumn [vsnet-alert 15230]. It was bright at 15.6 mag on Nov. 8, 2013, from Youichirou Nakashima's survey images. The AAVSO database contains only faint observations at 17-18 mag in 2013 November. The small brightening of this nova was detected in 2001 October, about 6 years after discovery (Brightening of Nova Cas 1995). It was bright at 13.2 mag on Oct. 26, 2012, from Youichirou Nakashima's survey images. It tends to be in outburst frequently. Rod Stubbings reported the outbursts in mid November and mid December. But nobody reported the outburst in late October [vsnet-alert 15230]. Outburst of an UG-type cataclysmic variable GZ Cnc was detected at 13.9 mag on 2012 Mar. 24 from survey images by Nobuo Ohkura. It was fainter than 14.6 mag on Mar. 21. Rod Stubbings reported the last outburst on Mar. 17. So GZ Cnc rebrightened within only 1 week [vsnet-alert 14363]. We detected that a dwarf nova V542 Cyg is in outburst at 14.5 mag on July 17.66, 2012(UT) from Youichirou Nakashima's survey images. It was faint at around 17.5 mag on May 27, June 9 and July 7 [vsnet-alert 14773]. We detected that a dwarf nova V767 Cyg is in outburst at 15.2 mag on July 18.53, 2012(UT) from Youichirou Nakashima's survey images. It was not detected on any past Nakashima's survey images from 2007 Oct. 10 to 2012 June 28 [vsnet-alert 14781]. We detected another outburst at 15.9 mag on Oct. 7.52, 2012 (UT) from Nakashima's survey images. Maybe this star tends to be in outburst frequently [vsnet-alert 15005]. Several outbursts of a dwarf nova V792 Cyg up to 14-15 mag were detected from Youichirou Nakashima's survey images, on 2010 Sept. 28, 2012 Mar. 25, May 27 and Aug. 2 [vsnet-alert 14378][vsnet-alert 14823]. We detected that a dwarf nova V868 Cyg is in outburst at 15.2 mag on July 26.68, 2012 (UT) from Youichirou Nakashima's survey images. It brightened up to 14.8 mag on Aug. 2. The outburst of this star is not rare. However, because this outburst has not been reported yet, we reported it to CVnet. We detected that a dwarf nova V1006 Cyg is in outburst at 15.2-15.5 mag on July 17.66, 2012(UT) from Youichirou Nakashima's survey images. We found another old outburst at 14.5 mag on Nakashima's survey images on Apr. 24, 2008 [vsnet-alert 14774]. We detected that a dwarf nova V1113 Cyg is in outburst at 14.3 mag on July 30.54, 2012 (UT) from Youichirou Nakashima's survey images. This star seems to brighten in outburst frequently. The last outburst was reported on May 23 at 14.1 mag by Gary Poyner [vsnet-alert 14822]. Outburst of a dwarf nova V1504 Cyg was detected from survey images by Youichirou Nakashima at 13.9-14.2 mag on Mar. 11, 2012. It was fainter than 15.7 mag on Sept. 23 and 15.5 mag on Oct. 18 in 2011 by Youichirou Nakashima [vsnet-alert 14321]. Outburst of a dwarf nova V2289 Cyg was detected from survey images by Youichirou Nakashima at around 16 mag on Aug. 12, 2013. It was fainter than 17 mag on past survey images in 2012 by Youichirou Nakashima [vsnet-alert 16188] (Image). Then it was detected as bright as about 15-16 mag also on Sept. 18 [vsnet-alert 16437]. Taichi Kato commented that V2289 Cyg = 1H 1933+510 was originally classified as a nova-like type, but Claia Bryja revealed that it is an SS Cyg-type dwarf nova in 2000 [vsnet-alert 16198]. Mike Simonsen discovered the outburst at 13.3 mag on May 11.2910, 2012. We found that it was already bright at 13.9 mag on May 10.55 from survey images by Youichirou Nakashima [vsnet-alert 14567]. Outburst was discovered by Gary Poyner on Nov. 18, 2012. Pre-discovery observations was reported by Denis Denisenko by MASTER on Nov. 16. We found that AW Gem was already bright at 13.8 mag on Nov. 14 from Youichirou Nakashima's images [vsnet-alert 15230]. We detected that a dwarf nova KT Gem, an UGSS type with a range of 16-20 mag, in outburst at 16.1 mag on Sept. 26.77, 2012 (UT) from Youichirou Nakashima's survey images [vsnet-alert 14980]. We detected that a dwarf nova PS Lac, an UGSS type with a range of 15.0-17.6 mag, in outburst at 15.4 mag on Oct. 7.58, 2012 (UT) from Youichirou Nakashima's survey images [vsnet-alert 15004]. We detected that a dwarf nova V584 Lyr is in outburst at 15.8 mag on Aug. 2.49, 2012 (UT) from Youichirou Nakashima's survey images. Another past outburst was detected on Nov. 24.37, 2011 (UT) at around 15.7 mag from Nakashima's survey images [vsnet-alert 14829]. Taichi Kato commented the orbital period is already known in the discovery article. The small outburst of this nova-like star was detected in 1999 January [vsnet-obs 19665]. The VSNET data shows that this outburst was caught only by the MISAO Project. Another small outburst was detected on 2012 Apr. 16 from survey images by Youichirou Nakashima up to 11.8 mag, though it was around 12.4 mag in March [vsnet-alert 14451]. We detected that a dwarf nova NS Per, an UG type with a range of 15-<18 mag(p), in outburst at 16.3 mag on Jan. 15.59(UT) from Youichirou Nakashima's survey images. The AAVSO database contains the bright report at about 16 mag in mid November. So maybe NS Per brightens in outburst frequently in a short time [vsnet-alert 16792]. Outburst of a dwarf nova RY Ser was detected at 13.6-13.9 mag on 2012 Mar. 31 from survey images by Youichirou Nakashima. It was not visile on Nakashima's survey images on Mar. 21 [vsnet-alert 14410]. Masaru Mukai discovered it brightened up to 10.7 mag on Jan. 18, 2019 [vsnet-alert 22943]. Hideo Nishimura also discovered it several minutes later (TOCP). Patrick Schmeer suggests this outburst is very likely to be a WZ Sge-like superoutburst. This dwarf nova was announced in CBET 4603. The position of this cataclysmic variable had been ambiguous. Discovery of MisV0041 brought review of past plates and papers, then correct position was revealed. The mistake in the past paper was also revealed (IBVS 5326). We measured the magnitude from the SOHO/LASCO C3 images. It was constant at about 8.9 mag between 2007 Dec. 18 and Dec. 31. The nova was not observed on the earth at that time because conjunction with the sun. The gap of observations is about 2 months between 2007 Nov. 29 and 2008 Jan. 24 based on the AAVSO and VSOLJ database. Here is the light curve and the SOHO/LASCO image. The position of V354 Vul = LD 143 is revised in IBVS 4450 based on the identification with a USNO-A1.0 star. But we only found a faint 16-mag star at the position on Nobuo Ohkura and Ken-ichi Kadota's unfiltered CCD images, too faint as a Mira type variable with a V-band range of 13.2 - [15.2 mag. We discovered a variable star with a range of 12.2 - 14.4 mag at R.A. 19h50m08s.67, Decl. +22o32'17".8 (J2000.0), 25 arcsec from the cataloged position. That must be identified with V354 Vul, and we pointed out the mis-identification in IBVS 4450 [vsnet-id 258]. Brian Skiff and Graff Williams, the authors of IBVS 4450, agreed our identification is correct and the position in IBVS 4450 is in error [vsnet-id 259]. Outburst of a dwarf nova V405 Vul was detected on Mar. 13.81, 2012 (UT) from survey images by Youichirou Nakashima. V405 Vul is blended with a nearby 15-mag star, but it looks around 15 mag [vsnet-alert 14324]. Further outbursts were detected on May 11.68 and July 27.66 (UT) from survey images by Youichirou Nakashima, which revealed that V405 Vul brightens in outburst frequently with an interval of about 2 months [vsnet-alert 14571][vsnet-alert 14813]. New eclipsing variable near by GRB 030329 (GCN 2056). Eclipsing variation was confirmed from Ken-ichi Kadota's images of GRB 030329 (light curve). Our observations measured by Seiichi Yoshida from images taken by Ken-ichi Kadota are utilized in Ken'ichi Torii's paper (Astrophys.J. 597 (2003) L101-L106). We discovered a star with large proper mition of 0.5415 arcsec/year. It has been missed because it was blended with another star on Palomar plates around 1950. See also Large proper motion of GSC 3646-01698. 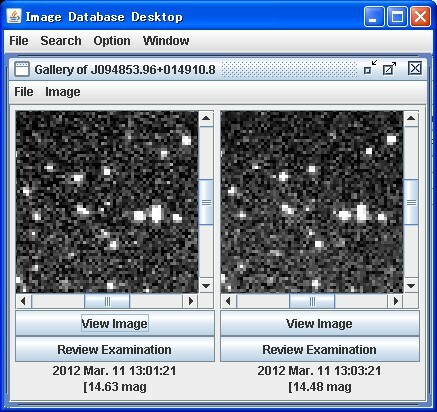 Outburst was detected twice on Feb. 4 (14.8 mag) and Nov. 21 (13.8 mag) in 2011 from Youichirou Nakashima's survey images. It was faint as 16.8-18.0 mag on other days. Another possible outburst was detected on Feb. 26, 2012 (14.0 mag) from Nobuo Ohkura's survey images, although it seems to be blended with a near by 15-mag star [vsnet-alert 14295]. Taichi Kato reported that it has reached up to 13.2 mag on 2006 Dec. 16. The SDSS color 17.591 17.549 17.175 16.927 16.786 is not incompatible with a CV. The ROSAT faint source 1RXS-F J052954.9+184817 may be associated [vsnet-alert 12503]. Denis Denisenko pointed out it is a very active dwarf nova with a short outburst cycle, as the outburst occured within a month on 2013 Dec. 29 and 2014 Jan. 23 [vsnet-alert 16837]. Symbiotic star NSV 24062 discovered by Yukio Sakurai in 1994 was recovered. The star discovered by the MISAO Project as one of the new variable stars was identified with NSV 24062 by Taichi Kato. The position in IAUC 6051 was inaccurate about 15 arcsec. Hitoshi Yamaoka reported that a star found on DSS images at the MISAO's position, but none found at the IAUC 6051's position. See also Recovery of NSV 24062. Dwarf nova discovered by Korotkiy Stas at Ka-Dar Observatory from images between 2012 Jan. 24 and 27. It was also visible at 12.4 mag on Oku Survey images on Jan. 26 by Youichirou Nakashima. It was 14.8-15.4 mag from 2011 Jan. 10 to 2011 Dec. 25 on Nakashima's survey images [vsnet-alert 14159]. We detected that a dwarf nova OT J170609.7+143452 is bright at around 14-15 mag at July 17.55, 2012(UT) from Nobuo Ohkura's survey images (Image). It was not visible on the images on May 23 and June 13 [vsnet-alert 14771]. Denis Denisenko reported MASTER-Tunka observed it on July 19 and confirmed that it is 16.6 mag, well above the quiescent magnitude of 17.7-18.4 mag [vsnet-alert 14772]. New cataclysmic variable OT J094854.0+014911 = CSS120315:094854+014911, discovered by the Catalina Sky Survey on Mar. 15, 2012, was already bright at 14-15 mag on Mar. 11 from survey images by Nobuo Ohkura (Image) [vsnet-alert 14330]. We detected that a dwarf nova SDSS J032015.296+441059.3 is in outburst at 16.4 mag on Sept. 11.72, 2012 (UT) from Youichirou Nakashima's survey images. The last outburst was reported on Feb. 29, 2012 up to 15.40: mag from Eddy Muyllaert [vsnet-alert 14943]. Kesao Takamizawa, the discoverer of TmzV868, announced it as a possible Mira type star. But Nikolai N. Samus pointed out that the type is different. Photometry from Nobuo Ohkura's images in the course of the MISAO Project supports that TmzV868 is not a Mira type variable. TmzV868 is not a red star, but systematic difference of magnitude between the reflector and camera lens is found. The reason is still uncertain. See also Photometry of TmzV868. Discovered from the observations of V4334 Sgr (Sakurai's object). Seiichiro Kiyota reported Rc-band CCD observations. The light curve suggests that MisV0001 is a Mira type variable star with a period of about 390 days. One of the peak was around 2451280 (JD). Taichi Kato reported that MisV0001 was about 16 mag on V-band image taken by Kyoto University Ouda team in 1996 March. Masayuki Suzuki also reported that MisV0001 is found on the Real Sky image taken on May 3, 1987, as a very faint star. Discovered from the observations of Comet 52P/Harrington-Abell. The comet was at apogee when brightest in 1998 December. Stars near by the comet were observed in details by chance, and the variation of MisV0002 was discovered. Kazuhiro Nakajima's observations revealed it is a W UMa-type (EW) eclipsing variable with a period of 0.3303555 days, brightness range of 1.0 mag. See also V523 Aur = MisV0002 is a W UMa-type eclipsing variable. Taichi Kato identified with V854 Oph. 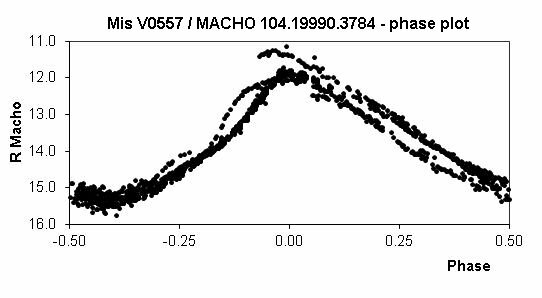 We thought that V854 Oph was originally identified with the emission-line star Stephenson No.141 by Stephenson, but it is probably erroneous (IBVS 4843). However, Nikolai N. Samus revealed that the identification of MisV0005 and V854 Oph is erroneous and MisV0005 is a new variable star [vsnet-chat 4071]. John Greaves identified with OGLE2-BUL-SC22-V383. The variation range from OGLE's I-band observations is small as 11.838 - 11.933 mag, although the range from MISAO's unfiltered CCD observations is large as 12.8 - 14.3 mag. The OGLE-II light curve looks similar to those of GCAS stars. A GCAS star should be B type, however, the 2MASS J-Ks color of MisV0015 is so large as 1.303 mag. See also Light Curve Analysis of MisV Stars Identified with Candidate Variable Stars from OGLE-II Bulge Data. Further researches revealed that identification of MisV0015 with USNO-1.0 0525.24950305 was wrong. There is no identification in USNO-A1.0 at the corrected position measured from Ken-ichi Kadota's images. At the same time, identification with OGLE2-BUL-SC22-V383 was also wrong. Based on the corrected position, MisV0015 is identified with a Mira type variable with a period of 217 days, OGLE2-BUL-SC22-V384. John Greaves pointed out the possible identification with an X-ray star 1RXS J180000.7-293416. But it is a normal Mira type variable because bright in the 2MASS images. Taichi Kato identified with CD-27.12786 (9.8 mag). Kato commented that it may be a recovery of one of the missing CD stars. Such a bright star is not recorded in the GSC. Maybe the star was in outburst by chance when the CD catalog was compiled. However, there are many CD stars whose position is erroneous. It is a normal Mira type variable because bright in the 2MASS images. It is not detected by the ASAS, so it is always fainter than 14 mag in V-band. So it is not likely that MisV0055 brightened up to 9.8 mag. 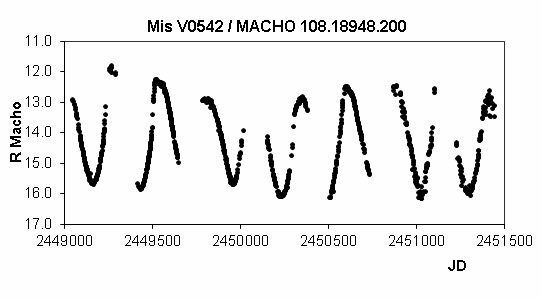 Stefan Huemmerich and Klaus Bernhard revealed that it is a Mira type variable with a period of 272.4 days, brightness range of 13.1-16.5 mag(Rc), using the MACHO project data (light curve, phase diagram). Tsutomu Fujiwara's observations revealed that MisV0101 is a Mira-type variable with a period of 210 days (light curve). Taichi Kato identified with NSV 25425. Kato revealed that Margoni and Stagni used blue photographic plate for the finding chart and labelled the wrong star (IBVS 4792). Tsutomu Fujiwara's observations revealed that MisV0118 is a Mira-type variable with a period of 290 days (light curve). Tsutomu Fujiwara's observations revealed that MisV0126 is a semi regular variable with a period of 430 days (light curve). Tsutomu Fujiwara's observations revealed that MisV0127 is a semi regular variable with a period of 250 days (light curve). Identified with LD 183. And Williams identified LD 183 with V1464 Cyg. Identified with HS 1332. Because the policy on new variable stars was not established at the discovery, we assigned the MisV number for this star despite of the identification. Taichi Kato identified with NSV 11661. We reported MisV0134 as one of the new variable stars because it is 103 arcsec from NSV 11661. However, Kato revealed that the MisV0134 was marked as NSV 11661 (S9039 in the original paper) on the Hoffmeister's discovery chart. So the cataloged R.A. and Decl. of NSV 11661 was very erroneous. Kato also pointed out that it is in the transition between a red variable star and a planetary nebula based on the IRAS data. See also Identification of NSV 11661 with MisV0134: A possible post-AGB variable. John Greaves identified with ISV1956+29 discovered by Iida. Tsutomu Fujiwara's observations revealed that MisV0166 is a Mira-type variable with a period of 280 days (light curve). Tsutomu Fujiwara's observations revealed that MisV0170 is a Mira-type variable with a period of 390 days (light curve). John Greaves pointed out the identification with AC2000 383539. AC2000 383539 is bright as 11.8 mag (B), but not recorded in any of Hipparcos Input Catalog, Tycho Catalog, GSC. So MisV0187 may be a cataclysmic variable and was in outburst by chance on the AC2000 plate in 1920. However, Seiichi Yoshida investigated the DSS 2 R-band image and revealed that there are two stars with the same magnitude with 6-7 arcsec distance in the east-west direction at the position of MisV0187, one is MisV0187 and another is AC2000 383539. So they are not the same. Only AC2000 383539 is found on the DSS 2 Bj-band image, so MisV0187 is probably a red variable. Photographic observations were reported from Kesao Takamizawa and Katsumi Haseda [vsnet-newvar 1194], [vsnet-newvar 1196]. The light curve suggests that MisV0200 is a Mira type variable star with a period of about 350 days. One of the peak was around 2452205 (JD). Takamizawa reported in [vsnet-newvar 1194] that the period is about 340 days, but period of about 350 days seems to fit the observations better. Observations by the MISAO Project were at faint phases when photographic brightness is fainter than 13.5 mag, so the unfiltered CCD peak brightness seems to be much brighter than 11 mag. Tsutomu Fujiwara's observations revealed that MisV0201 is a Mira-type variable with a period of 190 days (light curve). Tsutomu Fujiwara's observations revealed that MisV0206 is a Mira-type variable with a period of 320 days (light curve). Diego Rodriguez and Adolfo San Segundo's observations between 2009 and 2011, with Ken-ichi Kadota, Nobuo Ohkura and Youichirou Nakashima's observations between 1999 and 2007, suggest that MisV0218 is a Mira type with a period of about 380 days (light curve). Tsutomu Fujiwara's observations revealed that MisV0226 is a Mira-type variable with a period of 410 days (light curve). Taichi Kato pointed out the possible identification with DZ Ser, a nova in 1960. Kato commented that DZ Ser is a 14-mag nova discovered in spectral observations. The position is very different on some papers as follows. However, Seiichi Yoshida revealed that it is found as a faint star on the DSS 1 and DSS 2 images, and it looks brighter on R-band image. So it will be a red variable. Diego Rodriguez observed its slow fading in 2010 summer, and pointed out that it is a possible Mira variable. Revealed as Mira type by Patrick Wils's research. Tsutomu Fujiwara's observations revealed that MisV0306 is a Mira-type variable with a period of 375 days (light curve). Stefan Huemmerich and Klaus Bernhard revealed that it is a Mira type variable with a period of 163.8 days, brightness range of 12.0-15.7 mag(Rc), using the MACHO project data. Tsutomu Fujiwara's observations revealed that MisV0357 is a semi regular variable with a period of about 280 days (light curve). Tsutomu Fujiwara's observations revealed that MisV0359 is a Mira-type variable with a period of 295 days (light curve). Tsutomu Fujiwara's observations revealed that MisV0367 is a semi regular variable with a period of 305 days (light curve). The NSVS data revealed that it is a semi regular variable with a range of 12.7 - 13.5 mag, and a period of 100 days. The unfiltered CCD observations from 1999 to 2000 by Ken-ichi Kadota and Nobuo Ohkura coincided to the magnitude range and the period. However, it was observed as 15.4 mag, much fainter than the range, in the course of the unfiltered CCD observations by Nobuo Ohkura using a 300-mm camera lens in 2003 September. It is uncertain if the star really faded drastically, or that is an effect of came lens characteristics. Taichi Kato and John Greaves pointed out the possible identification with an X-ray star 1RXP J180245-2942.3. But it is revealed to be a normal Mira type variable based on the OGLE-II data. Tsutomu Fujiwara's observations revealed that MisV0374 is a Mira-type variable with a period of 195 days (light curve). Seiichi Yoshida and John Greaves found that it is not recorded in any of GSC 1.1, USNO-A2.0, IRAS, 2MASS, UCAC1, GSC 2.2. Greaves investigated the past images at the USNO Flagstaff Station Integrated Image and Catalogue Archive Service, but no star was found within 3 arcsec. It implies the star may be a cataclysmic variable. So Greaves called for observations in the MSDG-MISAO Campaign. Mike Simonsen, Rod Stubbings and C. P. Jones reported that is was fainter than 14.2 mag visually. But it was bright as 12.39 mag on the unfiltered CCD image taken by Fred Velthuis. In addition, Taichi Kato identified with MSX5C G011.9229+03.4421. Therefore, it is probably a Mira-type variable. Yoshida revealed that no star is found at the position on the DSS 1 Bj-band image. There are two DSS 2 R-band images. A star is found on one of them, but not uncertain on another image. Due to the high density of stars, past image investigation was hard. Taichi Kato revealed that it was observed as NGC 6194 No. 1130 and is a red star. Stefan Huemmerich and Klaus Bernhard revealed that it is a Mira type variable with a period of 194 days, brightness range of 14.6-18.9 mag(V), using the MACHO project data. Stefan Huemmerich and Klaus Bernhard revealed that it is a Mira type variable with a period of 377 days, brightness range of 12.2-16.3: mag(Rc), using the MACHO project data. Stefan Huemmerich and Klaus Bernhard revealed that it is a Mira type variable with a period of 342.0 days, brightness range of 11.5-<13.9 mag(Rc), using the MACHO project data. Taichi Kato identified with V949 Sgr, a nova in 1914. MISAO's observations, followed by Patric Schmeer's observations, revealed that it is not a nova but a red variable (IBVS 4845). John Greaves pointed out the possible identification with an X-ray star 2RXP J193158.1110964. But it is a normal Mira type variable because bright in the 2MASS images. Stefan Huemmerich and Klaus Bernhard revealed that it is a Mira type variable with a period of 356 days, brightness range of 11.8-15.9 mag(Rc), using the MACHO project data. Tsutomu Fujiwara's observations revealed that MisV0538 is a Mira-type variable with a period of 240 days (light curve). 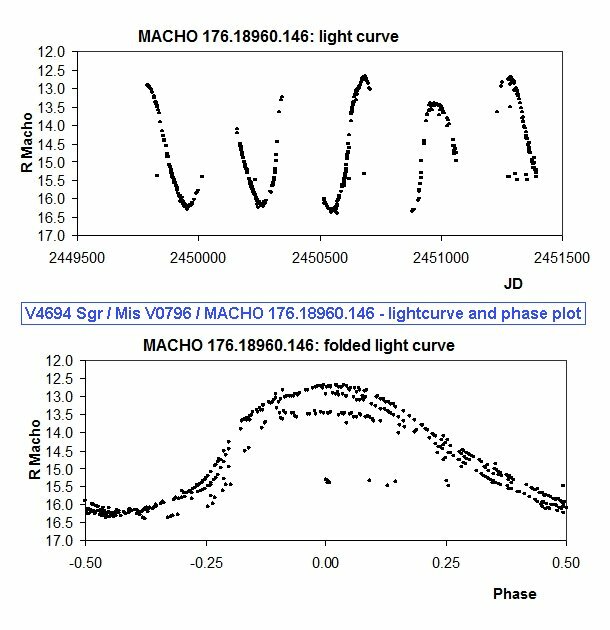 Stefan Huemmerich and Klaus Bernhard revealed that it is a Mira type variable with a period of 265.3 days, brightness range of 11.8-16.1 mag(Rc), using the MACHO project data (light curve, phase diagram). Stefan Huemmerich and Klaus Bernhard revealed that it is a Mira type variable with a period of 291.8 days, brightness range of 11.3-15.8 mag(Rc), using the MACHO project data. Stefan Huemmerich and Klaus Bernhard revealed that it is a Mira type variable with a period of 235 days, brightness range of 11.9-[14.2 mag(Rc), using the MACHO project data. 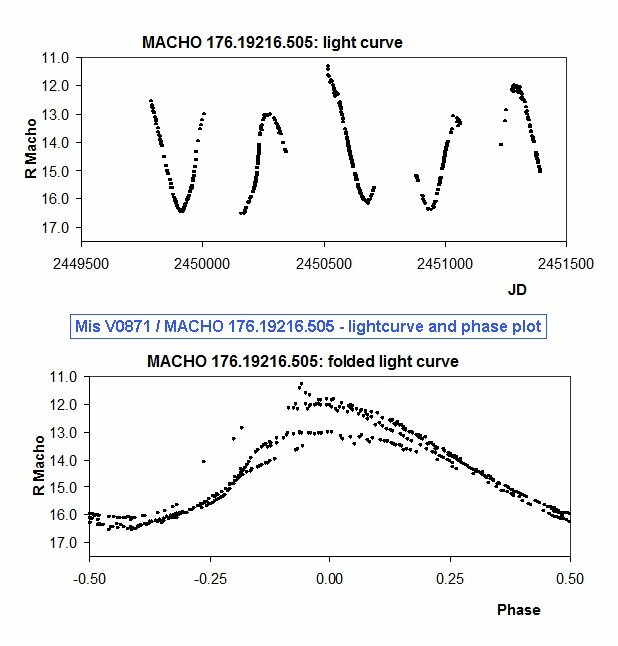 Stefan Huemmerich and Klaus Bernhard revealed that it is a Mira type variable with a period of 324.9 days, brightness range of 11.2-15.8 mag(Rc), using the MACHO project data (light curve, phase diagram). Mati Morel pointed out the possible identification with Luyten's V915 Sgr. The range by Luyten (12.3-13.5p) is not too dissimilar to that of MisV0562 (11.8-13.8C). V915 Sgr is regarded as GSC 6870-00090 in Herbig's paper (PASP 70,605) and classified as RCB type with a period of 285.2 days, which can well refer to the period of MisV0562. If MisV0562 is V915 Sgr, it turns out to be a SR variable [vsnet-chat 2797]. However, the variability of V915 Sgr = GSC 6870-00090 was also detected in the MISAO Project. So MisV0562 is a new variable star [vsnet-chat 2803]. Tsutomu Fujiwara's observations revealed that MisV0642 is a Mira-type variable with a period of 225 days (light curve). Taichi Kato pointed out that KY Sgr, a nova in 1926, is close, 126 arcsec from MisV0645. However, Seiichi Yoshida found it on the DSS 1 and DSS 2 images, so it will not be a cataclysmic variable. But it looks brighter on Bj-band image than on R-band image. Kazuhiro Nakajima's observations revealed it is an Algol-type (EA) eclipsing variable with unfiltered CCD variations of 13.18 mag at maximum, 13.84 mag at primary minimum, 13.26 mag at secondary minimum, and period of 1.6351 days (IBVS 5500). See also MisV0665 is an Algol-type eclipsing variable. Tsutomu Fujiwara's observations revealed that MisV0687 is a Mira-type variable with a period of 167 days (light curve). John Greaves identified with ROTSE1 J185841.70+302042.8. ROTSE's observations revealed that is is a long periodic variable. Taichi Kato pointed out that it is near by a planetary nebula PK 32-3.1 and influenced to the past observations of PK 32-3.1. MISAO's observations, followed by TASS's observations, revealed that MisV0701 is a red variable. In the past papers (Stenholm & Acker, MacConnell), PK 32-3.1 was noted that maybe it is not a planetary nebula because the spectrum was that of a red variable. But the spectrum was probably the mixture with a red variable MisV0701. The IRAS data is on the border between a planetary nebula and a red variable. That is probably the mixture of the two objects' characteristics, too. See also Influence of MisV0701 to a planetary nebula PK 32-3.1. This star is near by M27, so Gianluca Masi had noticed the variability and recorded in his WWW page. Tsutomu Fujiwara's observations revealed that MisV0758 is a Mira-type variable with a period of 330 days (light curve). Tsutomu Fujiwara's observations revealed that MisV0762 is a Mira-type variable with a period of 315 days (light curve). John Greaves reported that the position of V559 Cyg was revised in IBVS 4905 and came to coincide with MisV0774. John Greaves reported that the position of V1229 Cyg was revised in IBVS 4799 and came to coincide with MisV0779. 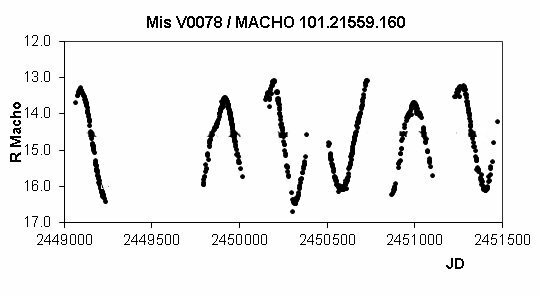 Klaus Bernhard and Stefan Huemmerich reported the MACHO data revealed it is a Mira type variable with a period of 298 days, brightness range of 12.7-16.4 mag(Rc) (light curve). Tsutomu Fujiwara's observations revealed that MisV0797 is a Mira-type variable with a period of 350 days (light curve). Tsutomu Fujiwara's observations revealed that MisV0813 is a Mira-type variable with a period of 283 days (light curve). Identified with 2MASS 0533337+344323. The 2MASS J-Ks value is 0.384 mag, so it is not a red variable. Masayuki Suzuki pointed out that the data in the USNO catalog is very reddish, 13.0 mag (R) and B-R=+4.0, but the USNO magnitude is uncertain. That is probably the influence of the very bright nearby star. Kazuhiro Nakajima revealed that MisV0814 is probably a peculiar variable, which is usually constant, but rarely shows minute-scale rapid variations. See also Peculiar variation of MisV0814. A very faint red variable in very crowded field. The USNO-A2.0 shows the color as B-R=4.0 mag. 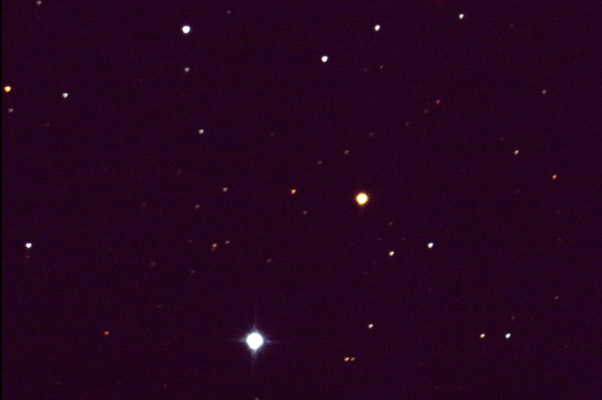 John Greaves commented that the star is only found on red E plate, and not found on blue O plate, though both plates were on the same day, which suggests this star is very red. On the MISAO images, the position of MisV0855 looks slightly different between in bright and faint state at a glance. That is because MisV0855 is not visible when it becomes faint, instead only a star about 10 arcsec southeast of MisV0855 is visible. Stefan Huemmerich and Klaus Bernhard revealed that it is a Mira type variable with a period of 220 days, brightness range of 12.7-16.0 mag(Rc), using the MACHO project data. 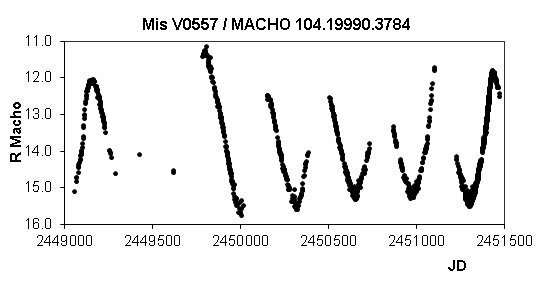 Klaus Bernhard and Stefan Huemmerich reported the MACHO data revealed it is a Mira type variable with a period of 255 days, brightness range of 11.6:-16.5 mag(Rc) (light curve). Stefan Huemmerich and Klaus Bernhard revealed that it is a Mira type variable with a period of 222.6 days, brightness range of 11.2:-15.4 mag(Rc), using the MACHO project data. When it was bright as 9.3 mag in the MISAO Project observations, Guy M Hurst and Mike Collins reported that MisV0884 was too faint, fainter than 11 mag. Hurst's observations are unfiltered CCD, as same as the MISAO observations. Masayuki Suzuki's observations revealed that it is bright only in infrared and very faint even in Rc-band, as 10.6 mag (Ic), 15.0 mag (Rc) and fainter than 16.8 mag (V). In 2010 summer, brightening up to about 11.5 mag was recorded in the survey images by Tadashi Kojima. Identified with 2MASS 1800214-304831, (J=10.764 mag, J-Ks=0.739 mag. It is probably not a red variable because of the small J-Ks value. Seiichi Yoshida revealed that it is clearly found on the DSS 2 R-band and Bj-band images, which also implies that it is not a red variable. However, Yoshida and John Greaves found that it is not recorded in any of GSC 1.1, USNO-A2.0, IRAS, 2MASS, UCAC1, GSC 2.2, despite of the bright peak magntiude (11.6 mag). However, further research revealed that it is recorded in USNO-A2.0 and USNO-B1.0. The R.A. and Decl. was inaccurate. A pair of double variable stars with 19 arcsec distance. Tsutomu Fujiwara's observations revealed that MisV0945 is a Mira-type variable with a period of 190 days (light curve). John Greaves reported that the position of V659 Aql was revised in the latest online edition of the GCVS and came to coincide with MisV0949. Tsutomu Fujiwara's observations revealed that MisV0951 is a Mira-type variable with a period of 235 days (light curve). John Greaves identified with one of the binary WDS 19277+2423 = Pourteau 3835, the pair of 13.6 mag and 13.8 mag stars. The cataloged position of WDS 19277+2423 is 48 arcsec from MisV0968. But the separation and position angle of MisV0968 and a nearby star USNO-A2.0 1125.12713797 is 9.8 arcsec in 111 degree, which correspond to those of WDS 19277+2423, 9.2 arcsec in 115 degree very well. Greaves commented that Pourteau 3835B is probably MisV0968 because the position well coincides with that of IRAS, 2MASS, MSX5C data. Tsutomu Fujiwara's observations revealed that MisV0988 is a Mira-type variable with a period of 430 days (light curve). Tsutomu Fujiwara's observations revealed that MisV1005 is a Mira-type variable with a period of 255 days (light curve). Tsutomu Fujiwara's observations revealed that MisV1008 is a Mira-type variable with a period of 207 days (light curve). Tsutomu Fujiwara's observations revealed that MisV1010 is a Mira-type variable with a period of 410 days (light curve). Tsutomu Fujiwara's observations revealed that MisV1013 is a semi regular variable with a period of 157 days (light curve). Tsutomu Fujiwara's observations revealed that MisV1015 is a Mira-type variable with a period of 220 days (light curve). 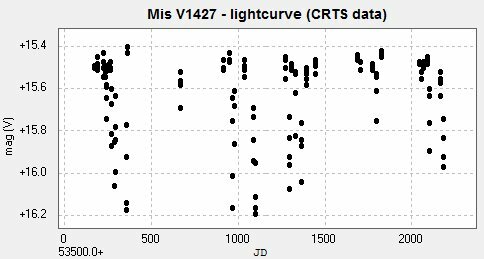 Tsutomu Fujiwara's observations revealed that MisV1021 is a Mira-type variable with a period of about 430 days (light curve). Tsutomu Fujiwara's observations revealed that MisV1022 is a Mira-type variable with a period of 270 days (light curve). In 2000, when the position of V1462 Cyg was inaccurate, we the MISAO Project discovered two new variable stars around it. One of them is identified with NSV 12600. 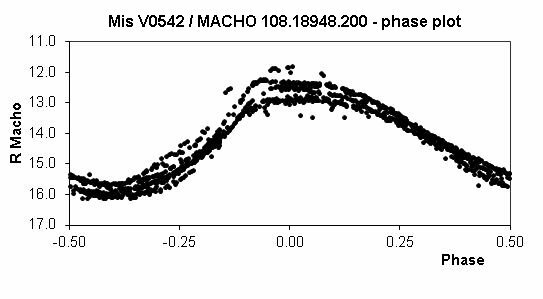 We thought V1462 Cyg ans NSV 12600 are the same star (IBVS 4814), and announced another star as a new variable star MisV1023. In 2003, the GCVS editors revised the position of V1462 Cyg (2003AstL...29..468S). The revised position is different from NSV 12600, but same as MisV1023. Therefore, it was revealed that MisV1023 was not a new variable. Because it is identified with IRAS 19596+3350 and an S-type star NSS 49, it is probably a red variable. But the 2MASS magnitude is J=7.312 mag, J-Ks=0.729 mag, so the J-Ks value is fairly small as a red variable. Brian Skiff commented that the 2MASS J-Ks value may be erroneous, probably because of saturation or errors in the data-reduction. Tsutomu Fujiwara's observations revealed that MisV1029 is a Mira-type variable with a period of 285 days (light curve). Tsutomu Fujiwara's observations revealed that MisV1040 is a Mira-type variable with a period of 500 days (light curve). Tsutomu Fujiwara's observations revealed that MisV1041 is a Mira-type variable with a period of 370 days (light curve). Tsutomu Fujiwara's observations revealed that MisV1042 is a Mira-type variable with a period of 500 days (light curve). Tsutomu Fujiwara's observations revealed that MisV1043 is a Mira-type variable with a period of 335 days (light curve). John Greaves pointed out the possible identification with an X-ray star 1RXS 201351.8+414557. However, Taichi Kato pointed out that a bright star GSC 3159.1639 is closer to the X-ray star and that will be identified with it. So MisV1051 and 1RXS 201351.8+414557 are not the same. Kazuhiro Nakajima's observations revealed it is an Algol-type (EA) eclipsing variable with V-band variations of 12.14 mag at maximum, 12.81 mag at primary minimum, 12.55 mag at secondary minimum, and period of 3.0421 days (IBVS 5600). See also MisV1061 is an Algol-type eclipsing variable. Tsutomu Fujiwara's observations revealed that MisV1062 is a Mira-type variable with a period of 285 days (light curve). Tsutomu Fujiwara's observations revealed that MisV1069 is a Mira-type variable with a period of 175 days (light curve). John Greaves pointed out that there is an X-ray star 1RXS 200142.7+465727 about 1 arcmin south of MisV1073. But they are probably not the same because of the large distance. Tsutomu Fujiwara's observations revealed that MisV1083 is a Mira-type variable with a period of 530 days (light curve). Tsutomu Fujiwara's observations revealed that MisV1088 is a Mira-type variable with a period of 420 days (light curve). Kazuhiro Nakajima's observations revealed it is an Algol-type (EA) eclipsing variable with unfiltered CCD variations of 12.64 mag at maximum, 13.24 mag at primary minimum, 12.90 mag at secondary minimum, and period of 1.5829 days (IBVS 5600). Times of minima observed by Ondrej Pejcha are published in the IBVS paper (IBVS 5645). Osamu Ohshima caught the eclipse in 2008 January, and the ephemeris of elicpses are updated precisely with Kazuhiro Nakajima's observations in 2003 and further observations in Europe. See also MisV1095 is an Algol-type eclipsing variable. John Greaves pointed out that the USNO-B1.0 color is so red as B1-R1=2.9 mag, which suggests the spectral class is K or M type. However, Seiichi Yoshida pointed out that the USNO-A2.0 color is so blue as B-R=0.3 mag. And the 2MASS color is J-Ks=0.759 mag, intermediate between blue and red. Therefore, it was suspected to change its color in the eclipse. However, no remarkable color change between normal phase and eclipse phase was observed by Osamu Ohshima's observations. The USNO-B1.0 color seems to erroneous. Light curve by Hidehiko Akazawa's observations is published. Kazuhiro Nakajima's observations revealed that it is a W UMa-type (EW) eclipsing variable with unfiltered CCD variations between 13.48 mag and 14.25 mag, and period of 0.4696 days (IBVS 5600). The brightness at primary minimum and secondary minimum is almost same. See also MisV1096 is a W UMa-type eclipsing variable. Ondrej Pejcha revealed it is a W UMa-type (EW) eclipsing variable. It is probably a blue one (EW/KE type), the minority among them. See also MisV1097 is a blue W UMa-type eclipsing variable. Kazuhiro Nakajima's observations revealed the unfiltered CCD variations between 13.04 and 13.74 mag, and period of 0.4688 days (IBVS 5600). See also Times of minima of a W UMa-type eclipsing variable MisV1097. Kazuhiro Nakajima's observations revealed it is a beta Lyr-type (EB) eclipsing variable with unfiltered CCD variations of 13.79 mag at maximum, 15.03 mag at primary minimum, 14.20 mag at secondary minimum, and period of 0.6331 days (IBVS 5600). See also MisV1105 is a beta Lyr-type eclipsing variable. Tsutomu Fujiwara's observations revealed that MisV1111 is a Mira-type variable with a period of 345 days (light curve). Tsutomu Fujiwara's observations revealed that MisV1115 is a Mira-type variable with a period of 330 days (light curve). Tsutomu Fujiwara's observations revealed that MisV1136 is a Mira-type variable with a period of 295 days (light curve). It was presumed as an eclipsing variable with large amptitude of almost 2 mag at the discovery. 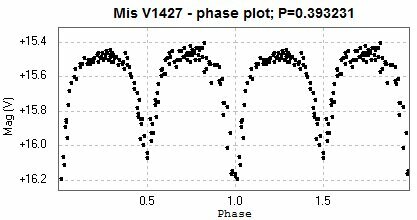 John Greaves commented that if MisV1140 is an Algol-like eclipsing variable, the primary may be an A star and the secondary may be a K star, for the large amplitude. Hitoshi Yamaoka pointed out the possible identification with an eclipsing variable GH Lac. The position of GH Lac is revised in IBVS 4906, identified with a star 3.2 arcmin from the position in the GCVS 4.1. But no basis is described in the paper. MisV1140 is 7 arcmin from the position in the GCVS 4.1. GH Lac was observed at Brno Observatory based on IBVS 4906 and the eclipsing variation was confirmed (IBVS 5263). Miloslav Zejda and Ondrej Pejcha measured MisV1140's brightness on those GH Lac images, and confirmed the variation of 1.1 mag. So MisV1140 and GH Lac are confirmed to be different objects. John Greaves pointed out that USNO-B1.0 B1-R1 value is 1.7 mag, so B-V may be around 0.8 - 0.9 mag. He also pointed out that it is within a dark cloud IREC 130 (diameter 106') and reddened about 0.16 mag. Kazuhiro Nakajima's observations revealed it is an Algol-type (EA) eclipsing variable with unfiltered CCD variations of 13.50 mag at maximum, 14.8 mag at primary minimum, 13.68 mag at secondary minimum, and period of 4.4479 days (IBVS 5600). See also MisV1140 is an Algol-type eclipsing variable. Tsutomu Fujiwara's observations and the MISAO Project surveys revealed that MisV1141 is a Mira-type variable with a period of 318 days (light curve). It attracted attention due to the identification with a H-alpha emission star HBHA 65-53. The campaign in "vsnet-campaign-unknown" and the MSDG observing campaign were launched, and many visual observers have been monitoring it. It did not show any evident variation in the first half of 2002, however, it showed frequent deep eclipse-like fadings in the latter half of the year. Based on the spectrums taken by Kenzo Kinugasa and Mitsugu Fujii, Taichi Kato revealed MisV1147 is a young stellar object, a Herbig Ae/Be type star. See also MisV1147: Young Stellar Object. Makoto Uemura, et al., revealed that MisV1147 has one of the largest amplitudes of variations among Herbig Ae/Be stars, and MisV1147 is peculiar which breaks the relation between the variation amplitude and the spectral type of Herbig Ae/Be stars (PASJ: Publ. Astron. Soc. Japan 56, S183-S192). We discovered a nova, which had been missed in 2001, in 2002. It was 12.7 mag in 2001 September, 14.3 mag in November, but faded to 20 mag in 2002 October. It was not found in any past Palomar plates nor DSS images. It took some time to be regarded as a nova, because IRAS 22562+6606 exists closly, and one of the Palomar plate images was erroneous. This nova was announced in IAUC 8014. See also MisV1181: Our First Nova Discovery. John Greaves pointed out that MisV1202 lies within/behind bright emission nebula Sharpless 134. Kazuhiro Nakajima's observations revealed it is a beta Lyr-type (EB) eclipsing variable with unfiltered CCD variations of 13.80 mag at maximum, 15.14 mag at primary minimum, 14.04 mag at secondary minimum, and period of 0.9784 days (IBVS 5600). Kazuhiro Nakajima's observations revealed it is a beta Lyr-type (EB) eclipsing variable with unfiltered CCD variations of 13.61 mag at maximum, 14.71 mag at primary minimum, 14.06 mag at secondary minimum, and period of 0.4288 days (IBVS 5600). See also New beta Lyr-type eclipsing variable MisV1222. Kazuo Nagai pointed out that it may be EA/RS type, a rare eclipsing variable with distortion wave outside eclipses. But the distortion in the light curve of MisV1222 is probably due to errors. Patrick Wils and John Greaves revealed that it is a Cepheid variable with a period of 8.2 days from the NSVS data (IBVS 5512). Based on the V-band survey from Oct. 25 to Dec. 7 in 2003, and Rc-band survey from Sept. 30 to Dec. 14 in 2004 by Nobuo Ohkura, the light curve is obtained and it was confirmed to be a Cepheid variable with a period of 8.2 days. The magnitude ranges are revealed to be 11.99-12.51 mag in V-band, and 11.20-11.80 mag in Rc-band. Toshihito Ishida commented that this star belongs to a group named bump Cepheid, a Cepheid variable with a bump in its light curve. Patrick Wils and John Greaves revealed that it is a Cepheid variable with a period of 6.60 days from the NSVS data (IBVS 5512). Based on the V-band survey from Oct. 25 to Dec. 7 in 2003, and Rc-band survey from Sept. 30 to Dec. 14 in 2004 by Nobuo Ohkura, the light curve is obtained and it was confirmed to be a Cepheid variable with a period of 6.60 days. The magnitude ranges are revealed to be 12.69-13.31 mag in V-band, and 11.96-12.68 mag in Rc-band. Kazuhiro Nakajima's observations revealed it is a beta Lyr-type (EB) eclipsing variable with unfiltered CCD variations of 12.68 mag at maximum, 14.04 mag at primary minimum, 13.19 mag at secondary minimum, and period of 2.6092 days (IBVS 5600). Kazuhiro Nakajima's observations revealed it is a W UMa-type (EW) eclipsing variable with unfiltered CCD variations of 12.94 mag at maximum, 13.54 mag at primary minimum, 13.50 mag at secondary minimum, and period of 0.3662 days (IBVS 5600). Kazuhiro Nakajima's observations revealed it is an Algol-type (EA) eclipsing variable with unfiltered CCD variations of 12.93 mag at maximum, 13.51 mag at primary minimum, 13.41 mag at secondary minimum, and period of 2.7129 days (IBVS 5600). Kazuhiro Nakajima's observations revealed it is an Algol-type (EA) eclipsing variable with unfiltered CCD variations of 14.15 mag at maximum, 14.53 mag at primary minimum, 14.48 mag at secondary minimum, and period of 6.6490 days (IBVS 5700). Kazuhiro Nakajima's observations revealed it is an Algol-type (EA) eclipsing variable with unfiltered CCD variations of 13.34 mag at maximum, 13.94 mag at primary minimum, 13.90 mag at secondary minimum, and period of 7.5530 days (IBVS 5700). Our second eccentric binary. The secondary minimum occurs at the phase of 0.484. Kazuhiro Nakajima's observations revealed it is a W UMa-type eclipsing variable with unfiltered CCD variations of 11.97 mag at maximum, 12.61 mag at primary minimum, 12.47 mag at secondary minimum, and period of 1.0650 days (IBVS 5600). See also New W UMa-type eclipsing variable MisV1239. It was mis-classified as SR type at the discovery. But Tsutomu Fujiwara revealed that it is not reddish as V-Rc = 0.0 mag. It seems to be an Algol-type eclipsing variable. Tsutomu Fujiwara's observations revealed that MisV1258 is a Mira-type variable with a period of 320 days (light curve). It was announced as a possible semi-regular variable with a small amplitude at the discovery. But further observations revealed it is a Mira type variable with large amplitude. Unexpectedly, V-band observations caught a 14.9 mag star at the position of MisV1262, when it faded down to 14.1 mag by unfiltered CCD observations. It was almost constant in V-band. Investigating DSS images and USNO-B1.0 catalog revealed that there is a complex of three stars within 15 arcsec at the position of MisV1262, and a nearby star becomes brighter than MisV1262 in B-band and V-band. A 14.9 mag star in V-band images must be the nearby star. The NSVS light curve also shows a rough variation of this star with a range of 12.8 - 14.1 mag. However, the NSVS data must be blending of the complex, and must not show the total variation. See also Complex Around a Mira Type Variable MisV1262. MisV1267 is recorded in the Hamburg-Bergedorf H-alpha Stars in Northern Milky Way as HBHA 18-40. MisV1267 is also recorded in the carbon star catalogs as CGCS 719 = CGCS J0435+5250. Therefore it is a carbon star with H-alpha emission. The MISAO Project observations suggest that MisV1267 is a Mira type variable with a period of about 400 days. The NSVS light curve shows a peculiar stagnation of brightening. The MISAO Project observations also suggest a hint of the stagnation. Brian Skiff commented that H-alpha emission is kinda the usual thing for cool carbon stars. Brian Skiff also pointed out that MisV1267 is identified with a carbon star Kiso C5-213, and an emission line star VES 820. John Greaves researched the NSVS data and confirmed the RR type variation between 13.5 - 14.3 mag with a period of 0.564 days. John Greaves found it may be variable while researching the NSVS data. Seiichi Yoshida confirmed this is indeed variable, and a new variable star, from images taken by Nobuo Ohkura, and announced it as one of the MISAO Project new variable stars. Tsutomu Fujiwara's observations revealed that MisV1273 is a semi regular variable with a range of 1.9 mag (light curve). The period may be about 140 days. Kazuhiro Nakajima's observations revealed it is an Algol-type (EA) eclipsing variable with unfiltered CCD variations of 12.25 mag at maximum, 12.97 mag at primary minimum, 12.87 mag at secondary minimum, and period of 4.6050 days (IBVS 5700). Patrick Wils researched the NSVS data and found that it is an EA type star with a period of 1.2727 days (or double). Patrick Wils researched the NSVS data and found that it is a Cepheid type variable with a period of 4.24(7) days. Patrick Wils researched the NSVS data and commented that MisV1278 has a small range 12.6-12.8, and a possible frequency of 2.787 cycles/day, or an alias thereof, but because of the small range, it is doubtful. Kazuhiro Nakajima's observations revealed it is an Algol-type (EA) eclipsing variable with unfiltered CCD variations of 13.35 mag at maximum, 13.82 mag at primary minimum, 13.77 mag at secondary minimum, and period of 1.1205 days (IBVS 5700). The eclipse events were detected only twice, 2003 Oct. 19 and 2008 Nov. 18, during our survey from 2000 to 2011 by Nobuo Ohkura and Youichirou Nakashima. It seems to be an Algol-type eclipsing variable with a very long period. John Greaves researched the NSVS data and found that it is a Mira type variable with a period of 170 days. It may be identified with NSV 11227 whose position is uncertain. If NSV 11227 is a red variable, an IRAS or MSX5C object near by the catalogued position is likely a candidate of identification. But there is none around the position. In the 2MASS images, there are three bright stars exist about 1 arcmin from NSV 11227 forming a triangle. The catalogued position of NSV 11227 is at the center of the triangle, so one of them may be identified with NSV 11227. MisV1286 is one of the three stars. Kazuhiro Nakajima's observations revealed it is a beta Lyr-type eclipsing variable with unfiltered CCD variations between 12.25 and 12.78 magnitude, and period of 0.7655 days (IBVS 5700). Kazuhiro Nakajima's observations revealed it is a W UMa-type eclipsing variable with unfiltered CCD variations between 12.52 and 13.25 magnitude, and period of 0.3280 days (IBVS 5700). Kazuhiro Nakajima's observations revealed it is a W UMa-type eclipsing variable with unfiltered CCD variations between 15.59 and 16.37 magnitude, and period of 0.7053 days (IBVS 5700). Kazuhiro Nakajima's observations revealed it is a W UMa-type eclipsing variable with unfiltered CCD variations between 14.01 and 14.85 magnitude, and period of 0.3571 days (IBVS 5700). Kazuhiro Nakajima's observations revealed it is a beta Lyr-type eclipsing variable with unfiltered CCD variations between 12.68 and 13.15 magnitude, and period of 1.0996 days (IBVS 5700). Kazuhiro Nakajima's observations revealed it is a beta Lyr-type eclipsing variable with unfiltered CCD variations between 13.29 and 14.18 magnitude, and period of 0.6616 days (IBVS 5700). Kazuhiro Nakajima's observations revealed it is an Algol-type eclipsing variable with unfiltered CCD variations between 13.91 and 15.27 magnitude, and period of 1.1110 days (IBVS 5700). Kazuhiro Nakajima's observations revealed it is an Algol-type eclipsing variable with unfiltered CCD variations between 14.58 and 16.20 magnitude, and period of 1.8060 days (IBVS 5700). Kazuhiro Nakajima's observations revealed it is an Algol-type eclipsing variable with unfiltered CCD variations between 12.98 and 13.73 magnitude, and period of 2.2002 days (IBVS 5700). Kazuhiro Nakajima's observations revealed it is an Algol-type eclipsing variable with unfiltered CCD variations between 13.61 and 14.89 magnitude, and period of 5.2633 days (IBVS 5700). Kazuhiro Nakajima's observations revealed it is an Algol-type eclipsing variable with unfiltered CCD variations between 11.97 and 12.50 magnitude, and period of 5.3364 days (IBVS 5700). Unusual eccentric binary. The secondary minimum occurs at the phase of 0.412. Michael Sallman reported that TASS caught this one in primary eclipse twice, on JD 2452911.80072 and 2453322.67412 (light curve). See also MisV1306: New Eccentric Binary. Tsutomu Fujiwara's observations revealed that MisV1311 is a semi regular variable with a period of 220 days (light curve). Kazuhiro Nakajima's observations revealed it is an Algol-type eclipsing variable with unfiltered CCD variations between 14.65 and 16.18 magnitude, and period of 4.5899 days (IBVS 5700). Kazuhiro Nakajima's observations revealed it is a beta Lyr-type (EB) eclipsing variable with unfiltered CCD variations of 11.90 mag at maximum, 12.70 mag at primary minimum, 12.12 mag at secondary minimum, and period of 1.28482 days (IBVS 5700). Atsushi Miyashita caught the primary eclipse on 2008 Feb. 21 and confirmed that the ephemeris error is less than 5 minutes (light curve). Observations by Kazuhiro Nakajima, and the NSVS data suggest that MisV1325 is almost constant at about 14.2 mag. Observations by Nobuo Ohkura and Youichirou Nakashima also suggest that it keeps almost constant at 13.5-13.8 mag from 2001 to 2007, however, it faded only in 2000 and became fainter than 14 mag. So MisV1325 may be a RCB type variable, which rarely fades out. Taichi Kato identified it with an emission-line star IPHAS J034712.63+571132.6. It was revealed to be a Herbig Ae/Be type star based on its color. During 4 seasons between 2009 and 2012, it was bright by 0.5 mag only in the season of 2010-2011 based on the observations by Tsutomu Fujiwara, Adolfo San Segundo, Esteban Reina Lorenz, Diego Rodriguez, Faustino Garcia. No evident variation was observed during each season. Nakajima's observations and the NSVS data suggest the small variation with an amplitude of about 0.2 mag. Kazuhiro Nakajima's observations revealed it is a RRAB type variable with unfiltered CCD variations between 13.85 and 14.80 magnitude, and period of 0.53201 days (IBVS 5700). Kazuhiro Nakajima's observations revealed it is an Algol-type eclipsing variable with unfiltered CCD variations between 13.82 and 14.80 magnitude, and period of 4.9478 days (IBVS 5700). Kazuhiro Nakajima's observations revealed it is an Algol-type eclipsing variable with unfiltered CCD variations between 14.22 and 14.71 magnitude, and period of 2.8610 days (IBVS 5700). Kazuhiro Nakajima's observations revealed it is a beta Lyr-type (EB) eclipsing variable with unfiltered CCD variations of 14.40 mag at maximum, 15.10 mag at primary minimum, 14.80 mag at secondary minimum, and period of 2.8271 days (IBVS 5700). Kazuhiro Nakajima's observations revealed it is an Algol-type eclipsing variable with unfiltered CCD variations between 13.74 and 15.14 magnitude, and period of 2.6525 days (IBVS 5700). The variation of this star was discovered in 1999 September in the course of the MISAO Project. But we regarded it as DV Oph because it was only 2.1 arcmin from the catalogued position of DV Oph [vsnet-id 111]. However, it was revealed that the semi regular variation of the star at the catalogued position of DV Oph ( ASAS 165756-2411.3 ) is clearly detected by the ASAS-3 data. Therefore, the variable star discovered by the MISAO Project was revealed to be a new object. Both DV Oph and MisV1333 are red variables. DV Oph is detected as 12.1-13.7 mag in the ASAS-3 data, but MisV1333 is not detected, fainter than 14 mag. That means DV Oph is brighter in V-band. On the other hand, MisV1333 looks much brighter than DV Oph in the 2MASS images. Therefore, MisV1333 is much more reddish than DV Oph, intense in infrared. Taichi Kato analyzed the Catalina Sky Survey data and revealed it is an RR Lyr-type (RRAB type) variable with a period of 0.5772 days. Taichi Kato analyzed the Catalina Sky Survey data and revealed it is an RR Lyr-type (RRAB type) variable with a period of 0.6338 days. Discovered during time series photometry of MisV1275. The light curve suggests it is a bright irregular variable with an average magnitude of 11.5 mag and a small amplitude of 0.42 mag. Not only the long term irregular variation, a short term small variation of 0.1 mag during several hours was also confirmed by the time series photometry on three nights. There are two entries in the NSVS catalog. The NSVS data suggests it is completely constant at 11.60 mag. 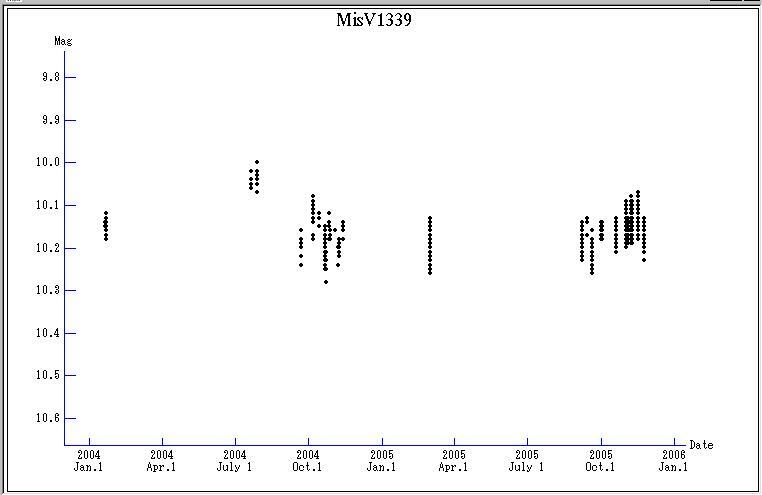 No variation over 0.1 mag was not recorded in 1999, which suggests MisV1336 is not a periodic variable. But the NSVS data must be blending with a southern star with similar brightness. Michael Richmond researched the TASS Mark IV database and found no significant variation in either V or I band (light curve). The mean color is (V-I) = 0.52. Note that the TASS Mark IV data is also blending. Kazuhiro Nakajima's observations revealed it is a beta Lyr-type (EB) eclipsing variable with unfiltered CCD variations of 12.58 mag at maximum, 13.55 mag at primary minimum, 13.01 mag at secondary minimum, and period of 0.9202 days (IBVS 5700). Discovered during time series photometry of MisV1317. The light curve suggests it is a semi regular variable with an unfiltered CCD amplitude of 0.25 mag between 10.02 - 10.27 mag. Not only the long term variation, a short term oscillation with an amplitude of 0.10 mag was also confirmed by the time series photometry on three nights in the course of Kazuhiro Nakajima's observations. Atsushi Miyashita's time series photometry in 2008 detected an evident short term variation with an amplitude of 0.3 mag on Feb. 1. However, the variation became unclear on Feb. 10. No variation more than 0.1 mag was detected on Mar. 6, Mar. 18 and Apr. 5. No evident variation was confirmed by Atsushi Miyashita's multi color photometry from 2008 to 2009. MisV1339 is almost constant at 10.323 +/- 0.022 mag in the NSVS data. Michael Richmond researched the TASS Mark IV database and found one feature in the I-band, but otherwise no obvious variations was found (light curve). The mean color is (V-I) = 0.79. Mitsugu Fujii's spectrum on 2008 Mar. 5 (the red is MisV1339) is a normal spectrum of a G-type star. No evident short term oscillation was detected by Fabrizio Marchi's time series photometry on Jan. 9, 2009. New Mira type variable adjoining to a Mira type variable V2010 Cyg = LD 162. MisV1340 is a northern component of double stars with similar brightness lying north-south direction with a separation of 20 arcsec, and the southern component is V2010 Cyg. We once judged the identification of V2010 Cyg was wrong and reported it as the revision of V2010 Cyg's coordinates [vsnet-id 299]. Afterward, we concluded both of the double stars are variable and announced the northern star as a new variable. See also Mira Variable V2010 Cyg and Another Adjoining New Mira Variable MisV1340. Tsutomu Fujiwara's observations detected the rapid brightening up to 11.5 mag in 2014 February, although it kept almost constant at 12.3 mag for over one year from 2012 Novembet to 2014 January [vsnet-alert 16920]. The NSVS data suggests it is a Mira type variable with a period of about 300 days and the epoch of JD = 2451370. The NSVS data suggests it is a Mira type variable, although the period is not determined. An Algol-type eclipsing variable. However, only two eclipsing events were detected on 164 nights during three years by Kazuhiro Nakajima. So the eclipse of MisV1351 must be very rare. Sebastian Otero researched the NSVS 8483544 and NSVS 8463372 data. But these NSVS stars are not MisV1351, about 1 arcmin north and south of MisV1351. Although a possible period of 3.69764 days was derrived based on the NSVS data, it must be false due to the erroneous data. Sebastian Otero pointed that MisV1351 was not measured by the TASS. Sebastian Otero pointed out that the 2MASS color is J-K = 0.91, very red. 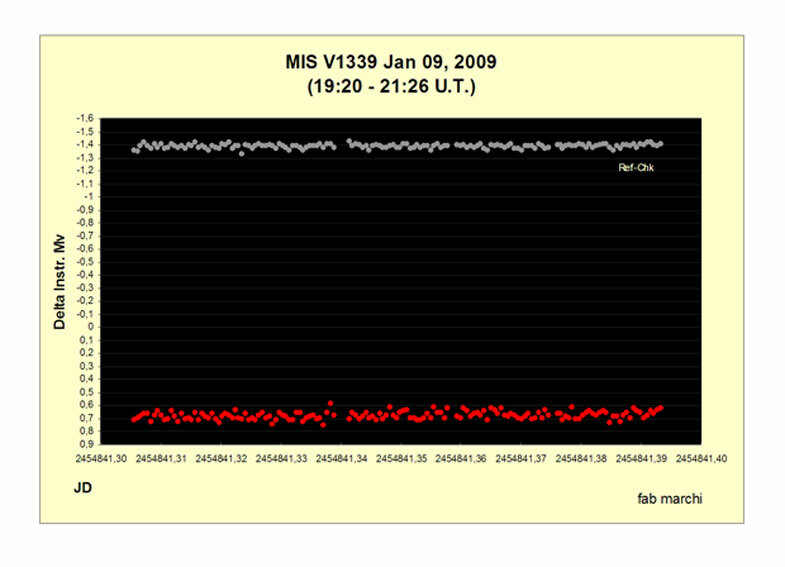 If MisV1351 is a long period eclipser, it is probably an EA/GS system. It was already found by Patrick Wils and solved by Sebastian Otero to be an EA eclipser with a period of 6.9092 days using the NSVS data, and published in IBVS 5681. Actually, it is not a new variable star of the MISAO Project. Although it had been almost constant during two months in 2001, the light curve during two months between 2006 and 2007 looks like a long term variation. Masayuki Suzuki's observations revealed that it is very red as 11.8 mag(Ic), 14.6 mag(Rc), 17.3 mag(V), <17.9 mag(B). Hidehiko Akazawa's observations also revealed as 11.6 mag(Ic), 14.4 mag(Rc), 17.2 mag(V). 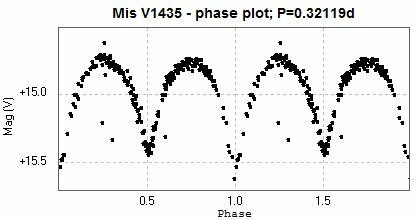 Tsutomu Fujiwara's observations revealed that MisV1357 is a Mira-type variable with a range of 4.2 mag (light curve). Tsutomu Fujiwara's observations revealed that MisV1358 is a Mira-type variable with a period of 320 days (light curve). Hidehiko Akazawa and Nobuo Ohkura revealed that MisV1360 is a W UMa-type eclipsing variable with a period of 0.398132 days based on their observations and the ASASSN data (light curve). Tsutomu Fujiwara's observations revealed that MisV1364 is a semi regular variable with a period of 300 days (light curve). Hidehiko Akazawa and Nobuo Ohkura revealed that MisV1370 is a W UMa-type eclipsing variable with a period of 0.246804 days based on their observations and the ASASSN data (light curve). The depth of the primary minimum and secondary minimum is almost same. Hidehiko Akazawa and Nobuo Ohkura revealed that MisV1371 is a W UMa-type eclipsing variable with a period of 0.421379 days based on their observations and the ASASSN data (light curve). Tsutomu Fujiwara revealed the color is Rc-V=0.5 mag. USNO-A2.0 color is R-B=2.0 mag. So it is not a red variable. The light curve between 2007 January and February suggests the period about 20 or 30 days. Ken-ichi Kadota investigated the DSS images, and found that the DSS images revealed that two faint stars are blending on the Nobuo Ohkura and Youichirou Nakashima's images. The northern counterpart is clearly visible on the DSS Bj-band image in 1989, however, not visible on the B-band images in 1952 and 1954. It looks bright on the DSS R-band and I-band images. The DSS images between 1989 and 1993, and the USNO-B1.0 data suggest no proper motion. So we concluded that MisV1376 is the northern counterpart, and is a red variable. Patrick Wils analyzed the NSVS data and revealed that MisV1384 seems to be an EA type variable with a period of 1.1609 days. Patrick Wils commented that it has been found before by Wils P., Lloyd C., Bernhard K. (MNRAS 368, 1757), RRAB type variable with a period of 0.47414 days (not 0.902 days). Patrick Wils analyzed the NSVS data and revealed that MisV1386 is an EW type star with a period of 0.3406 days. Kazuhiro Nakajima revised the accuracy of the period as 0.340533 days. Patrick Wils analyzed the NSVS data and revealed that MisV1387 is an EW type star with a period of 0.2628 days. Kazuhiro Nakajima revised the accuracy of the period as 0.263002 days. The USNO-A2.0 color is B-R = -0.4 mag. The RGB composite image from DSS I, R and Bj images also suggests that MisV1396 is remarkably blue. MisV1396 faded only once by the MISAO Project observations. It is almost constant the other days. The NSVS light curve shows MisV1396 is almost constant, or maybe it shows a small irregular variation. But Arne Henden revealed it is not so blue, as the TASS color is (V-Ic) = 0.41, the Tycho color is (B-V) = 0.275, and the 2MASS color is J=10.704, H=10.662, K=10.592. Phase diagram is revised based on the observations by Hidehiko Akazawa and Nobuo Ohkura with the ASASSN data (light curve). Stefan Huemmerich reported the Catalina Sky Survey data revealed it is an Algol-type (EA) eclipsing variable with a period of 0.57889 days, brightness range of 15.20-15.90 mag(CV). Stefan Huemmerich, Klaus Bernhard and Sebastian Otero reported the Catalina Sky Survey data revealed it is an Algol-type (EA) eclipsing variable with a period of 0.393231 days, brightness range of 15.45-16.20 mag(V) (light curve, phase diagram). Stefan Huemmerich and Klaus Bernhard pointed out that the light curve shows a possible chromospheric activity. Hidehiko Akazawa and Nobuo Ohkura revealed that MisV1428 is a W UMa-type eclipsing variable with a period of 0.772402 days, brightness range of 12.12-12.55 mag(V) based on their observations and the ASASSN data (light curve). Stefan Huemmerich and Klaus Bernhard reported the LINEAR and Catalina Sky Survey data revealed it is an Algol-type eclipsing variable with a chromospheric activity (EA/RS type), with a period of 0.4629 days, brightness range of 14.35-14.90 mag(CV). It exhibits a long term mean magnitude change, probably caused by a long period spot cycle (light curve, phase diagram). Stefan Huemmerich reported the Catalina Sky Survey data revealed it is a W UMa-type (EW) eclipsing variable with a period of 0.32119 days, brightness range of 14.7-15.6 mag(V) (light curve). We discovered a quasar QSO B0133+47 brightened up to 14 mag in 2007 November. It is recorded as 18-19 mag in the catalogs, so it is revealed to be an optically violently variable QSO. Taichi Kato commented that a quasar with such a large amplitude is rare. Well researched in the radio observations, however, little observed optically. Nobody has noticed that this quasar becomes so bright. It is about 7 billion light years from our planet, and the apparent brightness of 14 mag is extraordinary at this distance. In the DSS plates, it has been so faint as around 18 mag until 1992, but small outbursts have occurred twice in 1993 and 1995. 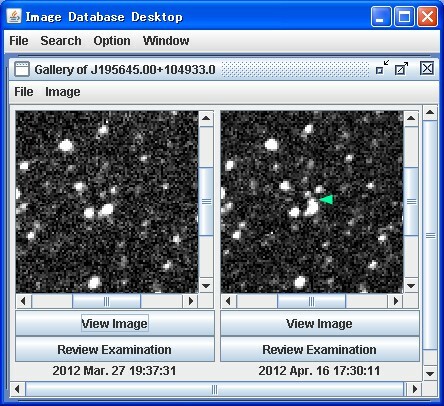 However, it is much brighter than any past DSS plates in the MISAO Project CCD images on 2007 November 11. John Greaves pointed out that it is recorded bright as 14.3 mag and 15.0 mag in the UCAC2 and CMC14 catalogs. Both observations were in 2002. Reinder J. Bouma pointed out that it was recorded as 15.0 mag on 2002 Sept. 24 in the Skymorph archive. No records brighter than 18 mag have been found before 1992, and no records fainter than 17 mag have been found after 1995. This quasar may became very active in recent years. John Greaves reported that an infrared flaring was observed in 2008 November by I.N.A.O.E. (Instituto Nacional de Astrofi'sica, Optica y Electro'nica) in Mexico (ATel #1874). It turns to be so faint as 18-19 mag again in 2010. Esteban Reina Lorenz reported that it faded down to 19.18 mag in 2010 November. This is the faintest record in its history. See also Discovery of optically violently variable quasar QSO B0133+47. Another optically violently variable quasar observed by the MISAO Project. But this is a well known quasar. We assigned the MisV number, but this is not our new discovery. The outburst in 2007 observed by the MISAO Project has been already reported by Stefan Karge [vsnet-alert 9356], and published at Karge, S., 2007, The Astronomer, Vol. 44, No 520, 100. Reinder J. Bouma searched the Skymorph archive and confirmed the clear variability of this object in 1997, 2002 and 2003. See also Discovery of Another Optically Violently Variable Quasar 4C 09.57. Seiichi Yoshida, Patrick Wils and Taichi Kato identified it with an H-alpha emission source HBHA 50-20 = IPHAS J205050.39+445011.7. Seiichi Yoshida investigated the 2MASS data, and found it is fairly faint in the J-band image, fainter than our unfiltered CCD images, although the color is very red and bright in the Ks-band image. Taichi Kato also pointed out that it is in a star forming region SFR G85.49-1.00, and this star seems to be a T Tau variable (possibly INSB type). Diego Rodriguez and Adolfo San Segundo Delgado reported that the color is very red as V-R = 1.6 mag. It faded rapidly from 14.69 mag to 17.26 mag within 3 months in 2009, and from 15.24 mag to 17.28 mag within one month and a half in 2010. It is brightening rapidly in 2011 up to 14.66 mag, approaching to the brightest record ever. Short term variation was detected by time series photometry by Hidehiko Akazawa on Nov. 16, 2011. See also MisV1441 Images and Observations. Four eclipse events of MisV1442 were detected on Oct. 6, Oct. 16, Nov. 4 and Dec. 18 in 2010 by Diego Rodriguez, Esteban Reina Lorenz, Miguel Rodriguez Marco, Faustino Garcia, Adolfo San Segundo, and it is revealed to be an eclipsing variable with a short period. New bright dwarf nova discovered at 14 mag from 2011 Jan. 8 images. It was bright as 12.8 mag already on Jan. 2 in the Stanislav Korotkiy and Kirill Sokolovsky's images. It revealed that the MISAO Project discovered this object about one week after the explosion, and the object has already faded by about 2 mag. Spectrum observations by Plaskett telescope and Akira Arai confirmed it to be a dwarf nova in outburst. Ken-ichi Kadota and Brian Skiff revealed that the progenitor before explosion is a 20.5-mag blue star. 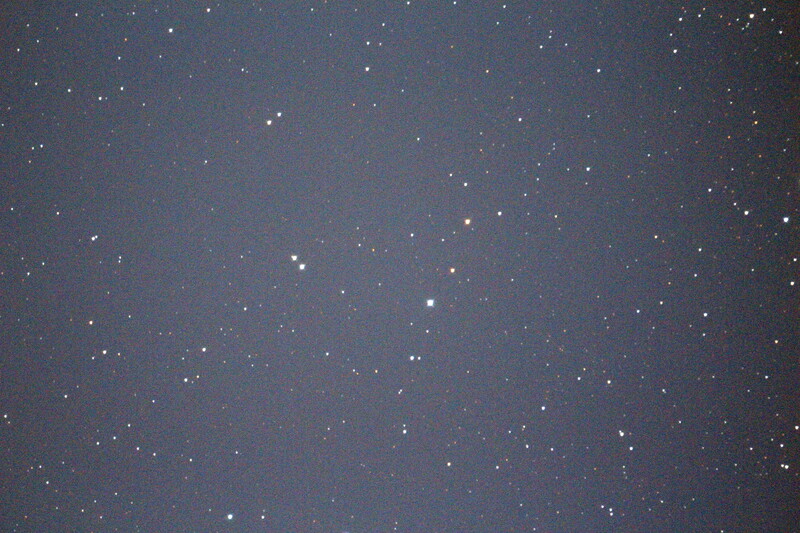 Adolfo San Segundo detected the re-brightening up to 15.32 mag on Feb. 3, 2011. This dwarf nova was announced in CBET 2633. See also MisV1443: Discovery of Bright Dwarf Nova in Orion. On the DSS images, it looks brighter on the blue plate than infrared plate. But Akira Arai obtained optical spectra and revealed it to be a Mira type. Probably the POSS2 Blue plate was taken around the maximum, and the POSS2 Infrared plate was taken around the minimum. See also Details of New Mira Type Variable MisV1444's Discovery. 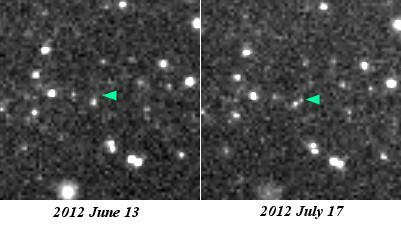 Youichirou Nakashima's survey images on 2011 Dec. 17 detected that it brightened rapidly by 2 mag or more, from fainter than 16.8 mag up to 14.7 mag, withiin only 4 minutes. It is possible real-time flare detection of a new flare star. A large flare tends to be observed on a nearby red dwarf, but no proper motion is recorded in the USNO-B1.0 catalog. See also MisV1445 : Possible Real-Time Flare Detection. Bright new object of 14.1 mag discovered from Youichirou Nakashima's survey images on 2012 Jan. 5. It will be an outburst of an X-ray source 1RXS J074112.2-094529. See also MisV1446: Outburst of an X-ray Source. ASAS-SN detected the new outburst at 14.69 mag on Mar. 20, 2017 [vsnet-alert 20807]. It faded out quickly, fainter than 17.12 mag, on Mar. 23 [vsnet-alert 20813]. Yutaka Maeda detected the new outburst at 13.9 mag on Oct. 23, 2018 [vsnet-alert 22647]. First new object discovered by Masaru Mukai, Kagoshima, Japan. The variation was confirmed by Youichirou Nakashima's Oku Survey and Akira Takao. There is a large difference of measured magnitude among observers, due to the infrared sensitivity of their CCD cameras. Patrick Wils and John Greaves pointed out that Martin Nicholson has already discovered its variation from the NSVS data and registered it into the AAVSO VSX database. The NSVS data shows the position at R.A. 05h57m39s.25, Decl. +08o49'57".61, which is roughly center of the northern 11-mag star, GSC 0716-01435, and the southern variable star. MISAO Project observations revealed that the southern star, GSC 0716-01707, is variable. However, this was a "already known" variable. New bright dwarf nova discovered at 13.4 mag from 2012 May 27 images. Seiichi Yoshida discovered this object on June 8, about 2 weeks have already passed. However, Denis Denisenko found the pre-discovery data by the MASTER robotic telescopes at 12 mag on May 13, and confirmed the outburst of this star. Possible new cataclysmic variable discovered at 15 mag from 2014 April 23 images [vsnet-alert 17303]. Seiichi Yoshida discovered this object on May 18, about 1 month has already passed. So we could not confirm it (Image by Kazuyuki Takeshita on May 18, Image by Toshikazu Muramatsu on June 1). Taichi Kato reported that it rebrightened up to 14.5 mag on May 17, 2017, in the ASAS-SN data [vsnet-chat 8244].